Successful options traders share one commonality: They all follow a mechanical, quant-based approach. Years ago, I never thought it made sense to trade earnings. It was a mostly a foreign concept; due to numerous limitations, trading earnings announcements just didn’t make sense from an efficiency standpoint. Click here to see why I’ve changed my mind. Add 52 weekly expiration cycles and a variety of highly liquid blue-chip stocks and the clarity of a once-unknown calculation . . . and we now have the opportunity to trade earnings announcements in an efficient and informed manner. What is the expected move? How does it change the game? First of all, the expected move is the price movement the market expects during a given expiration cycle. 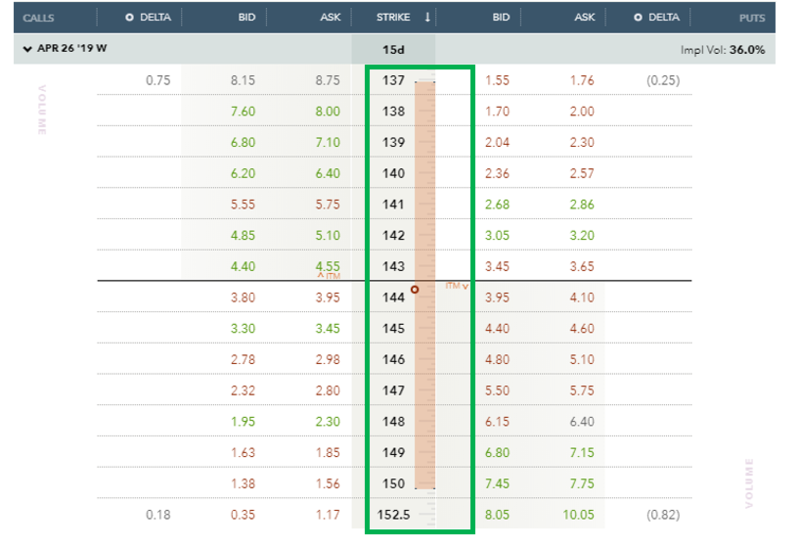 And now, we have tools that allow us to see, in real-time, the expected move for any given underlying stock around an earnings announcement. Take, for instance, IBM. The company is due to report after the market close next Tuesday, April 16. Below is the options chain for IBM. Notice the vertical orange bar highlighted in green. The orange bar signifies the expected move for IBM headed into next Friday. We should view the orange bar or expected move as our profit zone. I say profit zone because prior to earnings we wrap our earnings season strategy around the expected move. We do so because all research states that 80% of all movement after earnings are announced fall within this profit zone. This gives you an incredible edge if you play the strategy to trade earnings correctly. But the edge that is inherent in the known expected move MUST be coupled with a sound options strategy and a mechanical approach to risk management. When the three are combined, a powerful, profitable strategy exists. It is one that has seen our subscribers participate in a track record of 44 wins and 10 losses since we introduced the strategy 15 months ago. That’s a win ratio of 81.5%. But what’s most important is our cumulative gains, because a good win ratio doesn’t always mean stellar results. Our earnings season strategy’s cumulative gains . . . 597.8%. That’s right, 597.8% over 54 total trades. This is NOT a speculative strategy! The strategy doesn’t involve swinging for the fences or taking big risks. Our average return per trade is 11.1%. The strategy is about consistency . . . hitting singles and doubles . . . not home runs. Home run trades are for speculators and gamblers. We are not speculating with this strategy. We are simply taking advantage of a few knowns the market offers around each and every earnings announcement by taking a disciplined and mechanical approach. Best of all, our track record over the past 15 months backs it up! Click here to add this powerful strategy to your investing arsenal.